We are engaged in offering a large range of 3D Glass Fiber Sandwich Panel to clients. These panels can be configured in large firm or small firm. The panels are accessible in a diversity of stipulation. Moreover, these panels are highly admired in the industry due to durable nature and reliable performance. We are known as one of the leading manufacturers and suppliers of Cold Room Panels. Manufactured using high-grade raw material that is procured only from trusted & certified vendors, these panels are known for their sturdiness and durability. Our professionals make sure that our complete range of Cold Room Panels meets all set industry standards. - The main frame (columns and beams) is made of welded H-style steel YST 310 Grade Steel. - The columns are connected with the foundation by pre-embedding anchor bolt. - The beams and columns, beams and beams are connected with high intensity bolts. To satisfy the several requirements of the patrons, we are indulged in manufacturing, exporting and supplying a supreme quality range of EPS Metal Roof Sandwich Panel (EPS-FM-950). These panels are extremely treasured by our patrons for their high performance and durable nature. 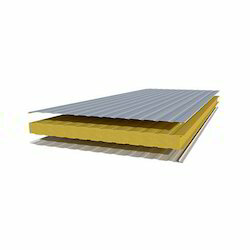 We deliver this EPS Metal Roof Sandwich Panel (EPS-FM-950) at leading market rates. 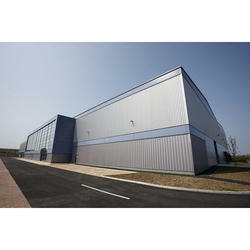 Sandwich panel housing for centralised air treatment systems for textile and nonwovens.